Last year, my daughter attended countless academic competitions and leadership conferences. When attending any functions that involve your career, you should always network. For this reason, I had business cards made for her. They are a great tool, but a suggestion one of the coordinators had was even better. There are Custom Labels you can purchase that are super convenient. You can have them made with whatever information you want. 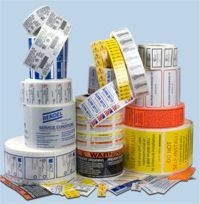 To make it even simpler, you can buy a self stick Custom Label in a roll. Whenever you want to exchange information with someone, you can put the sticker in their planner, notebook, etc. This worked out great for her. Many of the kids ordered these special labels, so they were totally ready to network. Many of you may be thinking, why even bother when you can use your phone? We live in a technological age, right? Here is the problem. Many of the students and adults she was networking with don't have mobile phones. I know this sounds nuts, but there is a reason. She is going into environmental engineering. Many of these people are vegans, concerned with their carbon footprint and dislike tech gadgets. They believe in organic gardening for their sustenance, reading books (not e-readers) and keeping life simple. They shun technology including ipods, cell phones, ebook readers, netbooks and the rest. Ironic that I make a living online through blogging, affiliate marketing and social media marketing and my daughter is not a fan of technology. Actually, I think it's pretty funny. Anyway, this simple system of roll labels is a great tool that anyone can use at any event. Although we in NY and those in CA cannot live without our iphones and androids, it's rude to think the rest of the world is the same way. Get these labels printed up for your next blogger conference. I'm sure it will make you ...hard to forget! very good and useful informations, thanks for sharing will be helpful in near future.